If you have any questions or want to enquire about dates, use our form to contact Hubert de Germiny or see their website for more information. 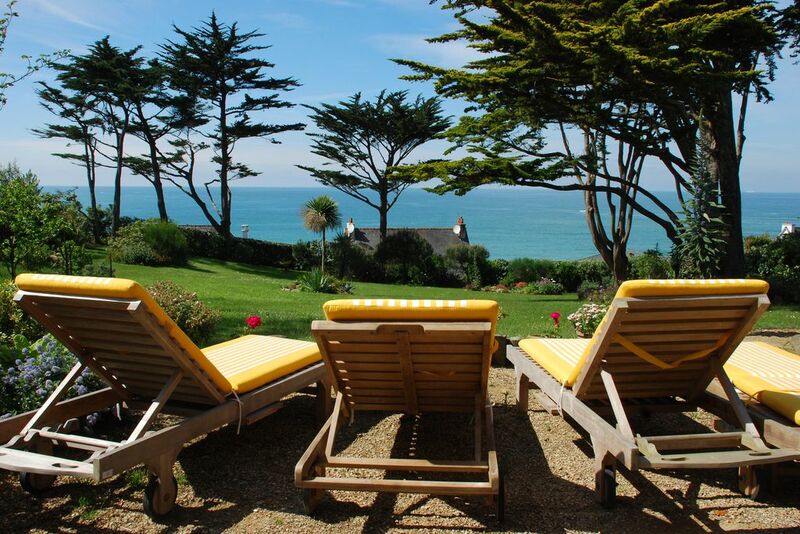 On a small side road that winds along the coastline, surrounded by huge old cypresses and pines, the villa faces west overlooking the lovely Sables Blancs beach: a five-minute walk and perfect at low tide. The garden is more English than French, the climate is warm – roses and lilies grow in profusion. On the lower ground floor, this pair of gîtes have French doors opening onto their own terraces and the ever-changing moods of a vast Breton sea panorama. The grey leather sofas are comfortable, the tiled floors are ideal for beach-sandy feet, and a cot and high chair are available. Bedrooms are colourful and inviting, with lace curtains for privacy; fresh and sparkling bathrooms have good showers. Well-equipped kitchens have cheerful, pretty china, and modern comforts include central heating and WiFi. In the villa above live the owners: friendly, well-travelled and happy to advise. The charming seaside village rejoices in an excellent brasserie as well as several restaurants, a weekly market and concerts in the local church. Availability is on gite website under 'Booking'. Short stays welcome, off season only (4 nights min). Just back from a wonderful break in the very comfortable Villa Germiny, with panoramic views of the sea and less than 5 minutes walk from a blissful stretch of white sandy beach. The owner was exceptionally welcoming and helpful and we had everything we needed to hand, including a surf school, local shops and several good restaurants in the idyllic town of Locquirec, a short walk from the gite. My only criticism was the somewhat variable weather, wish we could come back in May or June when the sunshine is likely to be more assured! This was a little dream come true!What a perfect place in a wonderful bay in the lovely Brittany. We stayed with our family with 3 children and visited several places and spend a lovely week and we will definitely come back. The house is very complete and spacious.The beds are comfortable and everything is very clean! The view is the best there is. Thank you very much!!!! At Villa Germiny the reality is even better than the photos/description; YES the views and the garden are really magnificent, but the ceilings indoor stated to be low (which nearly put us off as we know cottages) are sure not low/are no problem whatsoever. Furthermore the rooms are spacious and all what one could possibly need is there. We stayed in the larger appartment for 2 weeks in July'17, and as we liked it so much, we went back for another week in September'17. Definetely worthwhile visiting ! Many thanks Ann Lyn for being the perfect host, Erik & Daniela from Netherlands & Austria. This was such a lovely place to stay. The gite was very comfortable, well equipped and spotlessly clean with a beautiful garden. The view was gorgeous, the beach itself just a short stroll down the lane. The owner is delightful, a mine of useful information and very attentive and helpful. This is one of the best places we've ever stayed in and would highly recommend it to anyone. A first trip to Brittany with my dog, we stayed in the one bed gite at Villa Germiny. The gite was to a high standard, spotlessly clean, so comfortable and had everything we needed including a fantastic patio area and just a very short stroll down to the beautiful Plage Des Sables Blanc where we were lucky enough to watch the sun set every evening on account of the beautiful weather. Ann was a wonderful host, full of information and great tips on where to find things locally. Locquirec itself is an absolute delight. All in all a wonderful place to unwind, relax and enjoy! Five stars! We stayed at the newly redecorated and refurbished 1 bedroom gite ( and Anne generously showed us around the equally impressively refurbished 2 bedroomed one) for 12 nights and could have easily stayed for the month. The gite was perfect - wonderfully equipped and extremely comfortable. the new bathrooms were fab, with amazing showers. Anne was a really warm and available host and a great source of information.The house has a beautiful garden, really restful with the sound of the sea a constant. A great base for touring along the coast and inland. On our return to list. 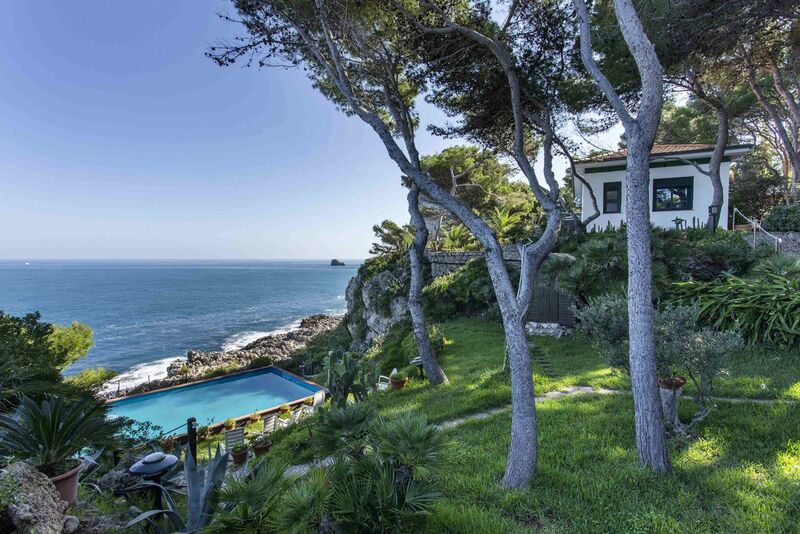 A beautiful location, facing the sea and literally 5 minutes walk to the secluded beach. The gites is very well equipped with lots of useful information. The hostess was particularly helpful, seeing to our every need and, friendly, and our wish was her command. A really lovely lady. Many picturesque nearby towns and villages including Roscoff, Morlaix, Lannion, Guerlesquin ...we enjoy the unspoiled and endless variety of north Brittany. Extensive renovations 2015, 4-star rating by 12345 Etoiles de France.....NOTE please... ABOUT SAWDAY photos: first 12 up to sunset = 2BR gite, after sunset = 1BR gite..